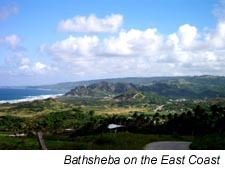 Each morning in the far reaches of the Eastern Caribbean the sun's first rays brush the blustery Atlantic shores of Barbados, roll slowly across the cane fields and stroke the island's west coast before moving on to wake the rest of the sleeping island chain. By the time the first roti has been wrapped in Bridgetown the west coast has sprung to life – bubbling children dressed in pressed school uniforms bounce down the roads while taxis beep their horns and stately women make their way to market. On the island's opposite shore Barbados' east coast remains much the same throughout the day as it has remained throughout the centuries: remote, rugged and wild. During our recent trip to the island, Bill and I were able to visit both of these dramatically different coasts. 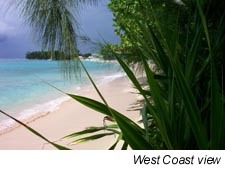 Barbados is famous for its fabulous west coast beaches, but don't overlook the wild east coast. The contrast between the two sides of Barbados is one of the many charms this enchanting island has to offer. Hidden among the many reasons to choose a Barbados villa vacation is a luxury that should never be overlooked: Non-stop flights to the island from New York and other cities. From JFK, one can take off in the middle of winter and touch down in the tropics in three and a half hours. We flew non-stop from Philadelphia to Barbados' international airport and were greeted by a fresh sea breeze and a cheerful steel band. The coast area around the airport is a maze of motion and color and the newly-arrived can easily become disoriented. WIMCO makes arrangements for visitors to be greeted at the airport and driven directly to their villa. Rental car agents can then meet up with visitors in the comfort of the villa. On the same note, I highly recommend arranging dinner at the villa the first night. I had been offered the same advice and decided against it, striking out from our villa in the late afternoon and driving into town for a sundown drink and a scrumptious meal. Darkness arrives quickly in the tropics and although I headed back to the villa just after dinner, I became disoriented by the dozens of roads leading off the main road. I turned down half a dozen and was greeted by beautiful villas at each turn. Unfortunately, none of the villas was the one I was staying at! Lesson learned. Take advantage of the superb villa staff and order in the first night! Give yourself a day or two to grasp the left-handed driving and the maze of roads, and at the same time enjoy a unique benefit of a Barbados villa vacation – the truly unbeatable villa staffs. If the islands undulating hills are as green and as sweet as a sugar apple, the beaches lining Barbados' west coast are the icing on the lime meringue pie. The leeward stretch of coast between Holetown and Speightstown is particularly blessed with fine, soft sand sandwiched between shady green trees and sapphire blue water. 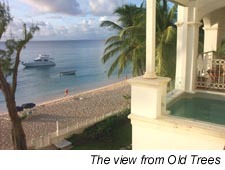 We spent our first several nights in Old Trees condo just south of Sandy Lane. From the villa's master bedroom I could see the stretch of sand heading north in a seemingly endless curve. 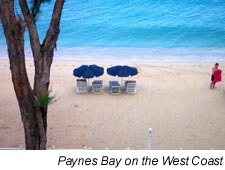 Defined as several beaches, such as Mullins Beach (popular with swimmers and snorkelers) and Paynes Bay (a beach loaded with watersports of every kind), one could walk for several hours along the coast. The beaches are more or less connected, although if you hit certain spots at high tide you may end up wading through a bit of clear blue water. As Bill pointed out, one could walk all day and stop whenever the spirit grabbed you for a bite to eat at any of the enticing beachside restaurants. Surfside Beach Bar and Grill and Bomba’s Beach Bar are popular spots for lunchtime lobster bisque and ice-cold rum punch, while Lone Star, Mango’s and Mullins are waterfront spots where stylishly casual daytime dining converts to chic, romantic candlelit service after sunset. One night Bill and I had the pleasure of dining at the Cliff restaurant, a St. James' landmark that collects superlatives the way a beachcomber collects shells. Perched on a cliff overlooking the ocean, the restaurant's cantilevered deck juts out over the water and diners are serenaded by the surf beneath them. From our candlelit table I could spot the rolling shadows of sea rays gliding below. The only thing that can compete with the Cliff's spectacular setting is the innovative and creative menu designed by the restaurant's world-class chef. We kidded each other that, other the company, it was quite a romantic evening. By week’s end we had identified the problem with eating on the island: When it comes to dining on Barbados, you are simply spoiled for choice. If it’s not the pan-seared sea scallops at Olive's or the coconut shrimp at Tides, it's trying to choose between the ginger pumpkin stew and the callaloo soup in your own villa. Provisioning on the island rivals provisioning anywhere else in the Caribbean and villa meals can be anything from fine Italian to the local favorite flying fish – you decide.